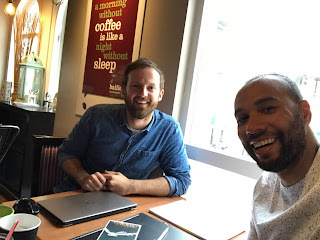 Earlier this summer, Andi Jarvis launched Wifi Refugees, offering free twenty minute marketing sessions to local businesses, in exchange for a donation to a local refugee charity. David from Soarscape was the first person to drop in for a session. Andi is a marketing consultant. He knows that small businesses often don’t have the budget to get professional marketing help, so he started this philanthropic venture that combines helping businesses, a refugee charity, and the independent coffee shops that he runs his drop-in clinic in for two hours each month. The inspiration for the project was hearing David from Outside In speak at the recent Power of Video Conference in Belfast. The social movement and clothing supplier operate a Wear One Share One model: when you buy a garment from Outside In, they send you one and they donate another to someone who is homeless. Hearing David’s story gave Andi the impetus to stop sitting on the idea and to stop sitting on his own idea and get on and implement it. The conference was on a Friday, the website was built by the Sunday and he launched Wifi Refugees on the Tuesday or the Wednesday. 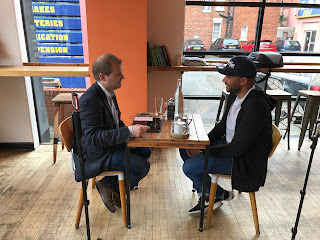 In return, you’re expected to buy a coffee to support the café who are allowing him to sit at a table running the two hour sessions, and you’re encouraged to donate to a local refugee charity. The money he raises will be given to Embrace NI. Some colleagues in London and Leeds are keen to extend Wifi Refugees to their cities. He wants the money to always go to a local charity working with refugees. While Wifi Refugees is Andi’s project, the concept is repeatable and adaptable by individual, groups, charities or churches. I asked Andi why he’d decided to support refugees rather than another sector or charity? He explained that there had been a couple of reasons. But Andi also knew about being an outsider, and a newcomer to the community he now lives and works in. “I’m not from Northern Ireland, I’m from England … I speak the same language, I have rights to work here, I’ve moved over here with a good job, I had family here at the time. Everything was in my favour. “And it still took me four or five years to settle and feel like this was my home. While Andi appreciated the fantastic work being done elsewhere in emergency camps and sea crossings, he realised that “the problems that refugees face don’t go away just because they get to somewhere that supposedly a developed nation that’s going to help them”. For Andi, with his background of migration and settling in, supporting refugees in his local area felt like the best fit. You can find out more about Wifi Refugees on its website,, and find the latest information about upcoming drop-in marketing sessions on Twitter and Facebook. Andi is running two drop-in clinics this month, both on Wednesday 16 August. The first is in The Bobbin (Belfast) between 1pm and 3pm, before he heads home to The Red Berry, Bangor between 6pm and 8pm.